Colombia’s so-called “false positives” scandal is centered around the extrajudicial killings of thousands of civilians by the military that dressed their victims as guerrillas to present them as combat kills to the media. While governmental and non-governmental organizations had been denouncing the practice for years, the Colombian government of then-President Alvaro Uribe denied the armed forces were killing civilians until late 2008. The scandal broke after prosecution investigators linked the bodies of unidentified rebel fighters found in the north of the country to people who had been reported missing in Soacha, a city south of the capital Bogota. Investigators found out that the military en masse was luring civilians to secluded areas, executed them, dressed them up as guerrillas and presented the body as a combat kill. In a June 2015 report, the Prosecutor General’s Office said it had found that the armed forces and civilian collaborators had killed 4,475 civilians since 1986. The same office said that 5,137 officials were implicated in the extrajudicial killings. More than 900, mostly low-ranking officials, had been convicted. Almost all of them were sent to prison, according to the prosecution. A 2018 academic study indicated that as many as 10,000 civilians could have been murdered by the military between 2002 and 2010. This would mean that more than half of the 16,000 combat kills reported that year were murdered civilians, and not guerrillas as initially claimed. According to media reports, the civilians were killed in order to collect bonuses. This has been categorically denied by the Colombian government in spite of abundant evidence and testimonies corroborating that soldiers were given financial rewards and extra holidays if they were able to present combat kills. What the practice did do — be it intentionally or unintentionally — was inflate the apparent success of the government in its fight against left-wing guerrillas and right wing paramilitaries. The UN called the extrajudicial killings “widespread” and “systematic” and figures showed the practice occurred in 30 of Colombia’s 32 provinces by the majority of military brigades. The Colombian military command and the government, however, have insisted that the murders were isolated incidents until the International Criminal Court ordered the investigation of 23 generals and six colonels. 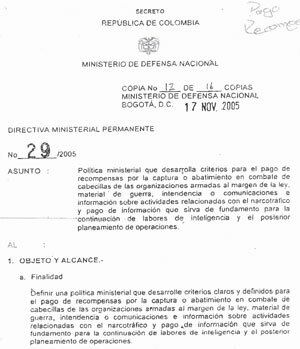 It is unclear when the practice began; according to a diplomatic cable from 1997, a “body count syndrome” in the Colombian Army tended “to fuel human rights abuses by well-meaning soldiers trying to get their quota to impress superiors.” Colombia’s Prosecutor General’s Office has registered extrajudicial killings since 1985, but did not register a steep increase until 2002, particularly in the northwestern Antioquia province. According to demobilized commanders of the paramilitary AUC, the practice began when authorities in the northwest of Colombia were complaining about high murder rates due to killings carried out by paramilitaries. In order to lower the homicide rate and increase the army’s apparent effectiveness, paramilitaries allegedly handed over murder victims to allied military commanders who then presented the victims as guerrillas killed in combat. When the paramilitary organization AUC demobilized between 2003 and 2006, the Colombian military had become solely responsible for combating guerrilla groups like the FARC and ELN. This government decree set the reward at COP3.8 million, or $1,500, for each killed ringleader or member of rebel groups. The number of civilian executions subsequently doubled from 386 in 2005 to 753 in 2006 when Juan Manuel Santos took over Ospina’s role as defense minister. In spite of growing complaints by both governmental and non-governmental human rights organizations that the military appeared to be executing civilians on a large scale, Santos ignored the allegations. Consequently, the practice worsened to the extent that in 2007, 40% of the 2,000 reported combat kills were in fact executed civilians. Unhindered by political pressure, the military kept on killing civilians and reporting them as killed guerrillas until in 2008 the Washington Post revealed the practice and Colombian weekly Semana reported on one case that happened in Soacha, a city neighboring the capital Bogota where at least 11 men had disappeared. The publicity forced the resignation of National Army commander General Mario Montoya, who has since become one of 22 generals under investigation for the mass killings.